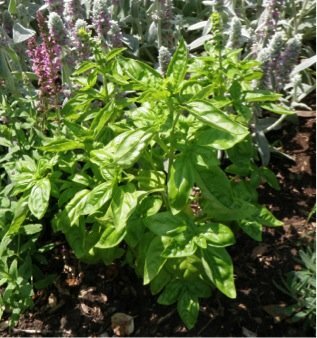 Growing basil is easy and I love the aroma and taste of basil. Mid-summer it hits the leggy point in its growth. Then it is time to trim off the herb’s flower tops to encourage bushier growing and more leaf. Composting the tops is easy to do, but I prefer making Basil Cubes with the flower stems. When the flower stems are still tender I cut them and chop the leaves into a “basil mush” by hand or with a food processor and freeze with olive oil. The result is a fantastic amalgamation of olive oil and herb – perfect for dethawing and spreading on Italian bread with fresh tomatoes and garlic or adding to chili and tomato sauce recipes. 3. Put the basil in a blender, add a small amount of olive oil. Blend thoroughly into mush. 4. Freeze in ice cube trays. 5. Include in any recipe that calls for basil. 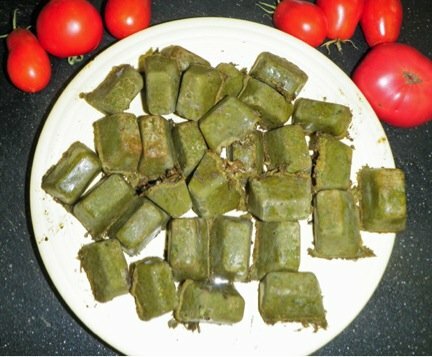 Basil cubes last several months in the freezer and are the perfect solution for adding garden fresh flavor to any recipe that calls for basil. The good news? This technique works for any variety of basil including Thai Basil and Purple Basil. Try it, you will love it! Shawna Coronado is a professional writer for green lifestyle living and organic gardening. Her organic living photographs and stories have been featured both online and off in many international home and garden magazines and multiple books. You can learn more about her at http://www.shawnacoronado.com.